WHITE PLAINS — After a lifetime of devotion to causes that ranged from feeding the hungry to helping seniors age in place, White Plains residents Paul and Barbara Schwarz were honored with their own day throughout the county on Thursday at the White Plains Historical Society’s annual dinner. White Plains Mayor Tom Roach proclaimed Thursday, May 12, 2011, to be Paul and Barbara Schwarz day in the city, while Westchester County Legislator Bill Ryan proclaimed it to be Paul and Barbara Schwarz day in Westchester. 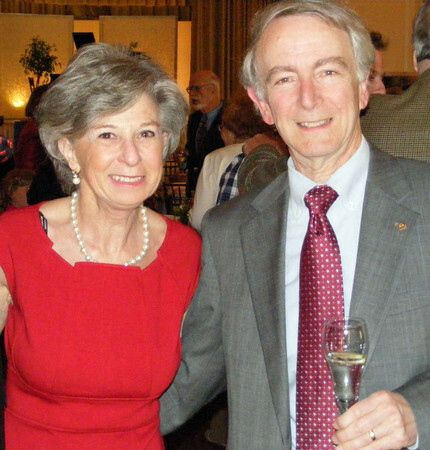 The White Plains Historical Society declared the couple "Citizens Extraordinaire." It was the twenty-second bestowal of the honor, which recognizes residents who have dedicated themselves to the White Plains community. A half a dozen current and former legislators came to honor the couple and enjoy the annual event: including former White Plains Mayor Sy Schulman; White Plains Common Council Members Milagros Lecuona, David Buchwald, and John Martin; as well as former Council Members Bill Brown, Harry Bright and Lawrence Delgado; New York State Assemblywoman Amy Paulin (D-88th District, which includes White Plains) and State Senator Suzi Oppenheimer (D-37th District, which also includes White Plains). The Schwarzes spent their professional lives as teachers. Barbara Schwarz taught in White Plains Public Schools until 2003, and still works as a substitute teacher. Paul Schwarz taught in Scarsdale, and retired in 2002. "They both, at some point, retired," Ryan said. "What that meant was they had a lot more time to volunteer." During their careers they found time to work in summer camps; work politically; deliver Meals on Wheels or with the Lord's Pantry; volunteer with the White Plains Library; work with the League of Women Voters and more. "He [Paul Schwarz] really is everywhere," said Roach. "I bump into him at the library, at Meals on Wheels, at Aging in Place. Barbara is the same thing. They're the perfect couple. The Hospital Auxiliary, the League of Women Voters — all of these things are done — and when Barbara's involved, she's not [just] involved, she's in the middle of it. What separates White Plains from any other community is the high percentage of people who care. Barbara and Paul are the quintessence of that spirit." The event was held in the Woman's Club, also known as Ridgeway, the C.V. Rich Mansion, which is on the National Register of Historic Places. The award speeches followed a dinner and were then followed by a speech from long time National Geographic and book author Thomas Allen. Allen's most recent work, “Tories, Fighting For the King in America's First Civil War,” describes the difficulties of that war, framing it as not a war for independence, but as a genuine civil war. One of the war's pivotal battles, in which George Washington's 14,500 troops fought against Major General Howe's 13,000, took place in White Plains. The historical society is headquartered at the Purdy House, which they lease fro the city. Washington was stationed at the Purdy House during the Battle of White Plains. Several of the White Plains Historical Society’s members reenact that battle and showed dressed in old New York Army or militia uniforms. They opened the ceremonies for the Schwarzes, carrying a Revolutionary War banner and the National Flag. The Schwarz's honors didn't end with the speeches, though. Mayor Roach noted that he had spent a lot of time campaigning with Paul Schwarz, and always ran his statements through Schwarz to check for meaning and nuance. "If Paul said it was okay, it was okay," said Roach. When Roach showed Schwarz the City proclamation declaring it to be Paul and Barbara Schwarz Day, Paul Schwarz's reaction was that he was reading the proclamation late in the day and there were only a few hours left. "As mayor," Roach said, "I give you tomorrow, too." In that case: Happy Paul and Barbara Schwarz Day!! !